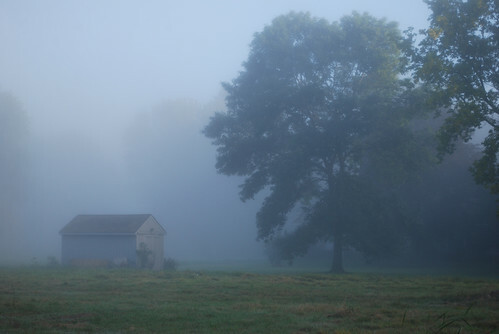 It seemed appropriate that my drive to campus today was through a thick fog. The windshield wipers kept brushing wet drops off the windshield while I strained to see what might be in front of me: a tree, a mailbox, the tail lights of another car. The first week of classes tends to be a blur of activity, with so many things happening that I can barely see what’s right in front of me. I’m trying to memorize the names of more than 80 students, scrambling to make sure my syllabi and class blogs have all the right information on them, and dealing with the hundreds of emails that I ignored while I was busy camping or kayaking or attending weddings. Figuring out how to share cars and juggle schedules has meant multiple phone calls every evening. Beautiful Smart Wonderful Daughter needs to be on campus bright and early every day. She lives in the next town with her boyfriend Sailor Boy and her brother Boy-in-Black, who also go to campus every day, but usually much later in the day. My son Shaggy Hair Boy and his girlfriend Smiley Girl live within walking distance of campus, but Shaggy Hair Boy will be teaching in a city school so he’ll need a car. The added complication this semester is that my youngest son With-a-Why is in college now, so he needs to go to campus every day as well. Snowstorm University doesn't have enough parking for all of its students, and that's what makes juggling all of this so difficult. My car has a parking sticker for certain parking lots, my kids' car has a parking sticker for a specific parking garage near campus, and the third car we share needs to be parked on the street, although those spaces fill up fast. If you approach campus anytime after 9 am, you can spend hours circling the streets looking for parking, unless you're Boy-in-Black, who is willing to park illegally and worry later about what tickets he might get. With-a-Why has a crazy busy schedule because he wants to do the full music program in addition to majoring in either math or physics, and he’ll get rides with whoever is going to campus the earliest in the morning or leaving the latest in the evening. This week, With-a-Why slept at the Castle on Sunday night so that he could get a ride with his sister on Monday morning, slept here on Monday night so that he could get a ride with me on Tuesday morning, and then slept at Shaggy Hair Boy and Smiley Girl’s apartment Tuesday night so he could walk to campus the next day. This nomadic life would suit him fine except for one thing: he's a music major and some of his homework has to be done on a piano, which means he needs to be here. In a few weeks, we'll have this all figured out. In the meantime, we're using all the skills we learned doing brainteasers. If we've got to get a chicken, a fox, and some corn across a river, and we can only take two at a time, and we can't leave the fox with the chicken or the chicken with the corn, which do we put in the canoe first? At the end of our kayak trip on the River That Flows Both Ways, With-a-Why and I were met by Red-haired Sister, who lives just outside Big City Like No Other. We tied the yellow kayak to the roof of her van, piled the camping gear inside, and then headed to her house. We needed to switch gears quickly. The whole family was gathering in the city for a celebration: the wedding of Urban Sophisticate Sister and Tall Architect. My first priority was to take a hot shower, but With-a-Why didn’t even change out of his paddling clothes. He sat down at the piano in Red-haired Sister’s house and began to practice. My sister had asked him to play Clare De Lune at the ceremony. And he’d be singing and playing after the ceremony as well. Five of the musicians in the family – With-a-Why, Shaggy Hair Boy, Tawkwondo Nephew, my brother, and Drama Niece — were providing the music for the reception. My brother had even come up with a name for the group: the Upstate Five. “We’ve come up with a set list,” Taekwondo Nephew said, as he pulled out his guitar. “I can fill you in.” With-a-Why nodded and switched playing mid-song as his cousin set music in front of him. “You need a haircut,” Red-haired Sister said to me. “No split ends at Urban Sophisticate’s wedding!” I happen to like how blonde the tips of my hair get during the summer, but everyone else calls it sun damage. So we raced off to get haircuts, then Red-haired Sister left me double-parked outside city flower markets while she ran into grab big batches of fresh flowers. That was the first in a flurry of text messages. The minister wanted to see a copy of the poem I’d written for the service. The cousin who was singing at the ceremony wanted to meet her accompanist – that is, my son Shaggy Hair Boy — at 4 pm. The little flower girl said she’d love a floral headpiece. Tall Architect’s family wanted to know if I’d be taking photographs. My parents were arriving at the train station in about half an hour. Oh, and could With-a-Why pick out a song to play as the bride and groom walked down the aisle? That’s when I began to question my youngest sister’s blind faith in her family members. But I needn’t have worried. It all came together beautifully. Red-haired Sister worked furiously on the flower arrangements, and they were lovely. The older woman who was singing relaxed as soon as she met Shaggy Hair Boy, who is both charming and talented. With-a-Why’s rendition of Clare de Lune, played on a Steinway baby grand, brought tears to people’s eyes even before the ceremony began. My sister claims that she had actually thought of asking him to play the very piece he chose for the processional: Can you feel the love tonight. I’d crowdsourced my poem by asking everyone in the family what they thought the secret to a good marriage was: the audience laughed at the funny parts and went silent at the serious parts, which is always a good sign. The venue for the wedding was a very old literary club, housed in a most beautiful old building. We ate dinner in the library, a gorgeous room with bookshelves so tall that they had ladders. After dinner, we went back into the ballroom, which had been transformed into a cabaret, with small tables set up near the piano and leather couches near the fireplace. The best part of the day, though, came earlier when my sister and her new husband asked me to take photos of them. I needed natural light — and so we spent twenty minutes strolling through Central Park, flower girl in tow. The park was crowded, as it would be on a sunny Saturday afternoon, and it felt like everyone in the city had come out to congratulate my sister. As we entered the park, a street musician switched to the song “Here Comes the Bride,” a runner waved and yelled her congratulations, and a woman pushing a baby stroller called out to compliment the wedding dress. The big urban park where people usually walk around in their own little bubbles became one big happy party, with strangers calling out their marriage advice and good wishes. Everywhere we went — whether it was a suburban neighborhood, a fancy yacht club, or the grassy banks of the river — we brought two flags with us. The top flag represents the Haudenosaunee, the native people in my area. The bottom flag represents, of course, the Two Row Wampum belt. Many of us put Two Row Wampum bumperstickers on our canoes and kayaks (I’ve actually never seen so many boats with bumperstickers before), and wore purple shirts or bandanas in solidarity. Every day before going to our boats, we gathered for a morning meeting. Paddlers would stand around in clusters, putting on sunscreen or packing rain gear, cramming cameras and snacks into dry bags. Sometimes Hickory, the lead paddler, would tell us something about the tides or the winds, and let us know what to expect. One of the organizers would tell us where we'd be stopping for lunch. And often we got messages that stuck with me all day just because they were so simple. "Remember, " Chief Edwards would say before we got into our boats. "Be kind to each other." Be kind to each other. I loved that. I can remember one morning, when the sky looked ominous, a nervous paddler who had just joined the day before said, "Last night, the news said a 40 percent chance of rain. Do we have an updated weather report?" Chief Jake Edwards looked at him and said in his deep voice, "There's a 100 percent chance of AWESOME." It did rain sometimes. 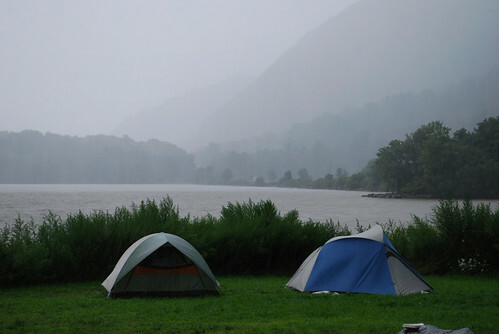 The most spectacular storm happened after we'd already landed and were setting up our tents on a grassy lawn near the edge of the river. The wind suddenly rose, and the sky above the river turned white. We could see the storm coming. When it hit, it was spectacular: driving rain, thunder and lightning, winds that twisted ropes and tossed clothing off lines. 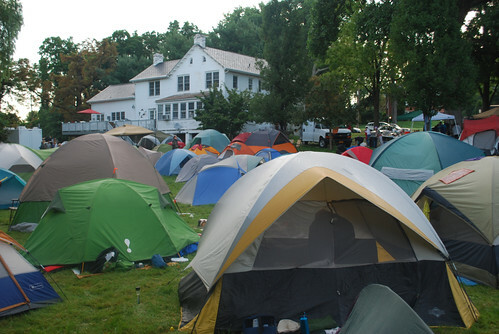 As I ducked into the tent to stay drive, I could hear a bunch of the teenagers yelling, yipping, cheering. The storm came and went, and it meant that our afternoon program became an evening program instead. The speaker was a clan mother from the Beaver Clan who began by saying, "We had to delay the program because of a storm. I guess that shows us where the real power is." The best morning of the Two Row Wampum trip was a bit windy -- but the wind and tide were both with us. The waves bounced us up and down, splashing water into my face, until I felt like I was on an amusement ride. I kept yelling "Sorry" every time we crashed into another kayak or canoe, and other paddlers would just look back and laugh. We were all having so much fun. "It's like bumper canoe!" one woman kept saying. It's lovely when the wind and the tide are working with you. We went a couple of miles in record time. "I feel so much stronger all of a sudden," a woman my age yelled over to me as her canoe went sailing along. Two kayaks did flip, but our safety paddlers got to them quickly, and by mid-afternoon, we had all arrived safely at the next stop, hungry and eager to share our stories. Honor the treaty! Protect the earth! If you look closely at the first bridge, you can see hundreds of people. As we paddled beneath, they were cheering and drumming, joining in our chants. We could see horses ridden by native men; the Dakota Unity Riders had come to support us, to spread their messages of peace and healing. One group unfurled a huge banner that showed two lines of purple against a white background: the symbol of the two row wampum belt. That kind of energy greeted us all along the river — in little towns, in yacht clubs, in parks. Whenever we landed, we'd be greeted by friendly people cheering us on, helping to pull in the boats, and offering us food and water. Somehow this journey seemed to bring out the best in people all along the river, who came forward to support us in all kinds of ways. In one town, a woman I'd known for less than a minute took me to her house so that I could have a shower. In another small town, a couple offered to let us camp in their backyard. All of us. That meant more than 100 tents, a line of porta-potties, trucks carrying gear and food, all of us paddlers, and our amazing ground crew that included small children and at least one little dog. When the man who lived there woke up in the morning and walked out on his back deck, he saw that an entire village had sprung up over night – a couple hundred people, drinking coffee and eating breakfast and shaking out wet tents to dry. He said to us, graciously, "Come back any time." 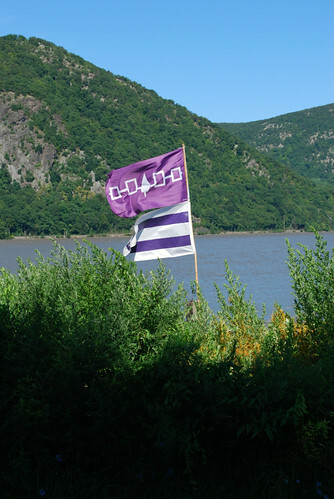 The two rows of purple in the Two Row Wampum belt represent two rows of people, natives and non-natives, paddling down the river of life side-by-side, with respect and friendship for each other. This August, we brought that metaphor to life. We really did paddle in two lines — native paddlers on the west and allies on the east. Sometimes we'd chant -- with one row yelling "Two Row!" and the other row responding, "Wampum!" Sometimes our leader, Hickory, would stop paddling and signal to the rest of us by holding his paddle high in the air, horizontal. Other paddlers followed, holding up their paddles for all to see. That meant a rest break, a chance for slower paddlers to catch up. That's when we'd clump together, holding the sides of kayaks and canoes to raft together, sharing water and snacks. The safety paddlers, who wore orange bandanas so that we knew who they were, would dart about to check on everyone. "Do you have enough water? Stay hydrated!" 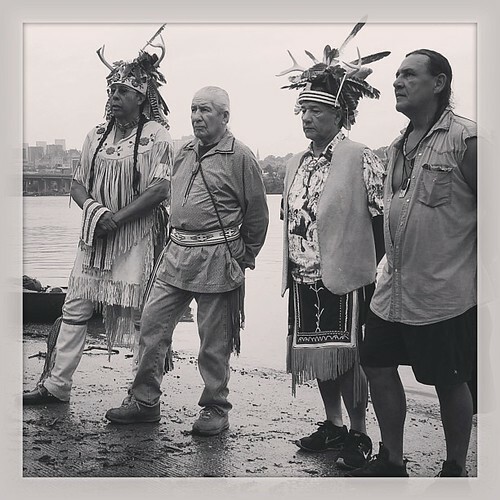 They started back in July, a group of paddlers in kayaks and canoes, carrying with them a replica of the Two Row Wampum Belt, which represents a 400-year-old treaty between the Haudenosaunee people, who have lived in this area since the beginning of time, and the more recently arrived white people. The Haudenosaunee still have the original wampum belt, I’m told, but I guess it’s safer to bring a replica when you’re traveling in a hand-carved wooden canoe on large, powerful river. Wampum are beads made from white and purple shells. The two lines of purple on the Two Row Wampum Belt represent the native people and the non-native people, respectively, traveling on parallel paths down the river of life, with the expectation that they will respect each other’s cultures and traditions. The Two Row Wampum Renewal Campaign is an educational and activist attempt to remind everyone that this 400-year-old treaty is still in effect. Native people and non-native people are coming together in an effort to strengthen friendships, build community, and foster respect between cultures. 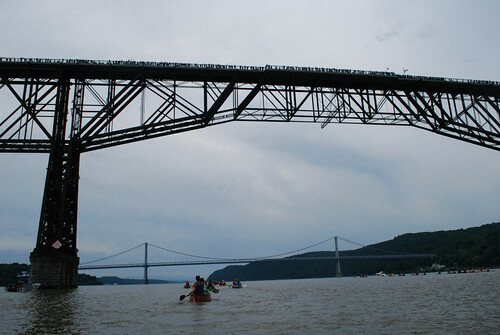 The big event of the campaign is the final leg of the canoe/kayak trip, a two-week journey down the Hudson, with one row of native paddlers and one row of allies, traveling side-by-side. 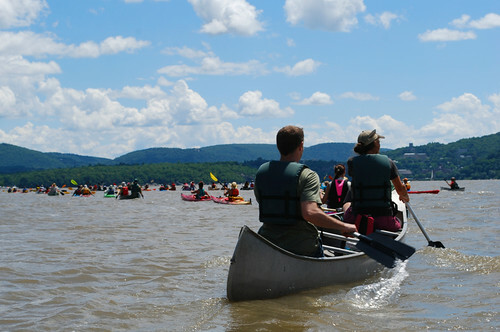 On Sunday of this week, the small group of paddlers who had brought the wampum belt to Albany were joined by native people from all over the country, as well as non-native allies. 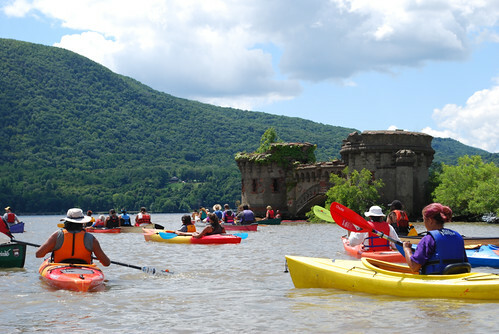 More than 100 kayaks and canoes launched that morning to continue the journey. Every stop along the river features educational and cultural events, as well as food provided by a swarm of volunteers. The Two Row flotilla won’t stop until we reach Manhattan. We’ll pull into Pier 96 on the west side, and then we’ll march the Two Row Wampum belt to the United Nations. I say “we” because my son With-a-Why and I join the flotilla tomorrow. We’ve already strapped the yellow kayak to the car, packed up our camping gear, and filled the dry bags. 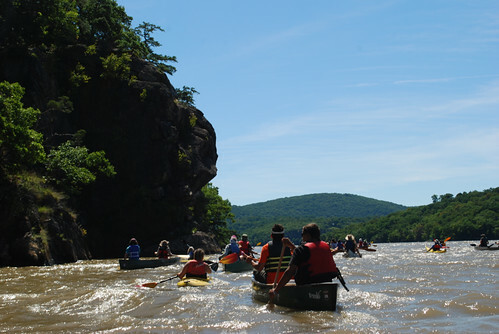 For the next week, we’ll be part of the community of paddlers who hope to raise awareness as we travel down the river. The trip is about building respectful relationships, and that includes our relationship with the earth. The lake that the Onondagas consider sacred is often regarded as the most polluted lake in North America, used as a dumping ground by industries back in the 1940s. The river we’ll be traveling on is polluted as well: people keep warning me to keep my head out of the water, especially as we near the city. The threat of hydrofracking, which could pollute huge amounts of groundwater, still hangs over many areas of the state. Clearly, when it comes to cleaning up our relationship to the earth, there is work to be done. We’ll be carrying this message as we travel down the river. I’ll be offline, but I’ll return with stories sometime in August. 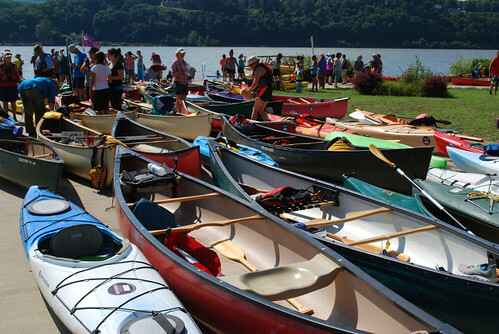 If you live near the river, come out to one of the events — or at the very least, wave to us as we travel, two rows of paddlers, through your community. 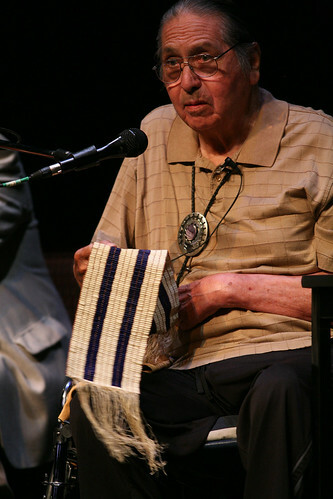 Chief Irving Powless holding the Two Row Wampum belt. The top photos shows Haudenosaunee leaders beginning the journey with their traditional words of thanksgiving. Both photos taken by the Syracuse Peace Council.